New Directions Center puts it best: "Assault victims, like other citizens, share community values and beliefs and interpret their experience in light of community values and traditions. Therefore, it is the belief of the New Directions Center that if the community believes that violence does in fact occur within its realm, and positive attitudes and a safe place for healing are offered, then more assaults will be reported." Your donations will help New Directions Center and the Waynesboro Players. The Performing Arts give the WP a chance to not only entertain but evoke consideration of ideas that can change lives. All while doing so in a safe place in which ones imagination can create possibilities in your community. The New Directions Center is a non-profit community organization, founded in 1996, devoted to diminishing the occurrence and impact of emotional, physical, and sexual violence in Staunton, Waynesboro, and Augusta County. Why 'One Dickens of a Fundraiser'? Charles Dickens was one of the most important social commentators of his time. He used fiction effectively to criticize economic, social, and moral abuses in the Victorian era. Dickens showed compassion and empathy towards the vulnerable of society, and contributed to several important social reforms. Dickens’s deep social commitment and awareness of social ills are derived from his traumatic childhood experiences. In his adult life Dickens developed a strong social conscience, an ability to empathize with the victims of social and economic injustices. As the WP brings 'Oliver!' the musical to the stage in March we became reinvigorated by Dickens and his empathy for his community. Theater can transform lives. 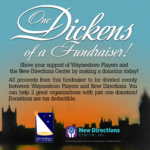 Thank you for your support of the WP and New Directions Center.